It's Pep Rally week and we are here today to share a sampling of the NEW Paper Smooches May/June release with you! FIVE new stamps and EIGHT new dies will be available to purchase at midnight on June 30th (eastern time) (12:01 am on July 1) You will find our new releases HERE! To add extra fun to our blog hop...we are offering up a prize! The prize - a $25. gift code to choose what you like at the PS online store. 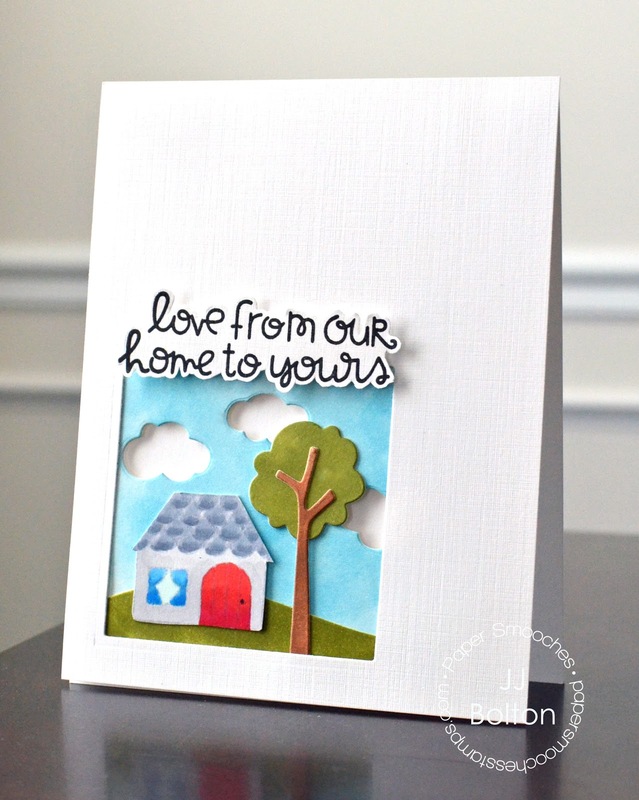 For my card today, I featuring the new dies called Background Builders. You are seriously going to flip over these dies. This set is filled with all kinds of landscape shapes like hills, roads, paths, trees, clouds, etc. So.many.possibilities! As you can see, I paired the dies with one of the teeny house stamps in the Bitty Bungalows set to create a little scene:) When I'm using standalone dies, I like to match the stamped images. So you'll notice that I used the no line Copic technique to color my bungalow. That way you don't get distracted by the hard black lines. Here's a close up on how I assembled the layers. I even reverse cut some clouds to add one more layer! If you're wondering, I colored all my die cut pieces with blended Distress Ink. The color is softer and more uneven (in a good way) than just using straight colored paper. So much fun to put together! Thanks so much for stopping in! Now keep on hopping! My good friend, Jocelyn, is up next! I'm sure she's going to knock your socks off! Great versatile card! Love it! Love the clouds, great dimension. Always, ALWAYS love your cards. Thanks! What an adorable little scene you've created here, JJ, so clever! What a beautiful sentimental card! I love the cut outs and scenery on this card, it is awesome. LOVE the cutout!!! I'm a new follower to your blog...love your style! Great card. The cloud cutout is awesome. Wow, great use of the different die cuts! Love how you card turned out! Oops lot of dimension and great scenery! Flipping CUTE!! Love the scene you created with these dies, JJ! I love this card. What a great idea of punching the clouds out. Great dimention. What a wonderful card. Love the die cutting and the placement of the elements! Thanks for sharing! Oh wow!! Love that card!!! The background dies look so awesome!!!!! I really can't wait to see it revealed! And your no line coloring is AWESOME!! Totally LOVE had to pin this for sure! Great fun card with all the dies! Shared about hop on my blog! Love your cute little scene! Love how your little scene came together. What a great idea for dies! Super cute scene, takes new home card to a whole new level! Oh, I love the sweet scene...SO cute! LOVE the cut out sentiment too! This card is gorgeous! I love the scene. Like the scene you've created. Especially like the clouds. Who wouldn't feel welcomed to the neighborhood after receiving this card!! Great dimension on this card. Love! Absolutely adorable! I love how you did the scene within the square. this looks amazing!! can't wait for these dies!! Oh, what a charming scene you've created JJ! I love how you kept the card CAS, and how you shaped your sentiment...so clever! This set is going on to my wishlist for sure! Thanks so much for sharing it with us! Thanks JJ for the opportunity to win - love the card as usual! So cute! Love when little scenes are created! I adore the layers & depth of this card. Thanks for sharing. Great card! Looking forward to seeing Background Builders! Love your creative and clever design, so cute!!! Fabulous card! I love your design style!! Dang, girl, you rocked these dies! So cute. Looking forward to release! Love all the different dimensions. I just love these dies...such opportunities to create so many scenes. Well how fun is that! Love the window opening and the cut outs. Completely adorable! Love that blue background and cut out clouds! love this design and the little scene! I made a card recently on which I made a little scene. It would have been much easier with the dies! Adorable card - love how you cut out the saying and popped it over the opening -- great idea! Oh my Goodness! Beyond Beyond Cute! What a sweet card...love those cut-out clouds! What a great card design! So much talent! I love this card! I can't wait to have the chance to play with Background Builders myself! This is a really cute and fun card! Such a fantastic, versatile card. TFS. Very creative and unique design. I just made a card with a little cutout like this but it never crossed my mind to do it anywhere other than centred. LOVE this idea! Love the cute little scene. (Creating scenes is my favourite type of card making). love the pop of color..... thank you for it. Love that house! Very nice. Bitty Bungalows is a charmer. Great card! I love all of the adorable die cut elements! This is sooo sweet! Love it! So cute! I have friends who've just moved, so this set will be perfect! What a cute card!! I have so many friends moving now!! Aww, this is so cute, JJ! Love the cute little scene you created. I am loving these new scenery dies. Cute scene that you've created. I love how you reverse cut the clouds!!! Love all of the die cuts. Great card. Looks like a landscape portrait. absolutely adorable little scene! love the way you did the clouds! thanks for being apart of the blog hop. cute card. This is so much cuter than words can even say!!! Yeah!!!!! like they way your card has dimension. Great card! Love the cut out! Love the layers on this card- so cute! Very cute card. I love your coloring technique on the house. Wow, great card! I love the scene you created with the dies! this card is absolutely amazing, so beautiful! Charming little scene, JJ! Genius idea to use the "no line" Copic coloring for a softer look! What a sweet little scene. I think I have to agree I'm going to love the background builder dies. SUPER CUTE card JJ - LOVE the sentiment and sweet scene!!! Sweet card. Love the way you did this. Love all the layers! What a fun card! What a sweet scene! Love the clouds! This is so cute and so cleverly created. I love that you colored the cutouts instead of just cutting from cardstock, It really gives more dimension! What a cute card, I love the scene! Thanks for sharing. I love the depth you get with the dies, it makes the card look much more interesting to the eye. Love, love, love your layering.